The United Nations Educational, Scientific, and Cultural Organization passed a resolution on Thursday that diminishes the historic and spiritual connections of Judaism and Christianity to the city of Jerusalem after dozens of U.S. lawmakers called on the international body to reject the measure. Israeli officials and others in the pro-Israel community decried the resolution as anti-Semitic and said it was an effort to delegitimize the Jewish state. Twenty-four countries voted in favor of the measure while six rejected it, including the United States. Another 26 states abstained. No European nation approved the resolution, which was introduced by Egypt, Algeria, Morocco, Lebanon, Oman, Qatar, and Sudan. Sen. Ted Cruz (R., Texas) and Rep. Ileana Ros-Lehtinen (R., Fla.) led a bipartisan group of 40 lawmakers earlier this week in writing a letter to the Executive Board of UNESCO saying the resolution to be discussed Thursday and Friday was part of a broader effort to delegitimize Israel. "The United Nations’ obsessive hostility towards Israel will be on display yet again this week as UNESCO considers another blatantly biased resolution that unjustly singles out our close ally Israel with false accusations and criticism, and attempts to erase the specific deep-rooted, historical connection of Jews and Christians to Jerusalem, Israel’s eternal capital," Cruz said. 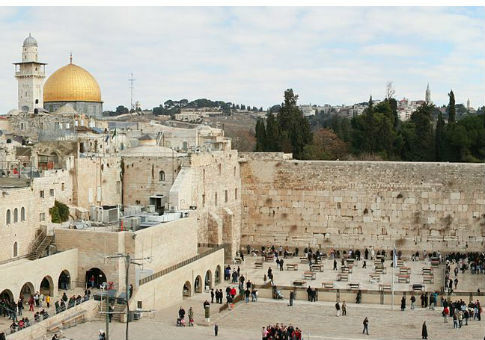 The resolution, postponed from the initial July vote amid fallout from the failed coup in Turkey, identifies holy sites in Jerusalem exclusively by their Muslim names. Jewish and Christian advocacy groups were particularly outraged by a provision that would declare the Temple Mount, the holiest site in Judaism, sacred to "Muslims only." "For thousands of years, Jerusalem has played a defining, central role in the history and identity of the Jewish people," Cruz said. "For Christians, Jerusalem is a seminal spiritual site. This resolution flies in the face of, among other things, science as recent archeological excavations, notably in the City of David, have revealed incontrovertible, physical evidence that reaffirms Jewish and Christian ties to the holy city of Jerusalem." The letter charged that the U.N. was attempting to "rewrite history." The resolution, titled "Occupied Palestine," also contains a litany of criticisms against Israel, charging the Jewish state of "aggressions against civilians," among other accusations. UNESCO’s Executive Board is meeting in Paris from Oct. 4 to Oct. 18 for its 200th session. This entry was posted in Issues and tagged Anti-Semitism, Ileana Ros-Lehtinen, Israel, Jewish Community, Religion, Ted Cruz, UNESCO, United Nations. Bookmark the permalink.